I bought this condo in mid-2000. It had always been a dream of mine to have a place at the beach...but had never found that 'right' spot until I came to Blue Mtn Beach and saw this great place on this beautiful beach with this amazing floor plan. I retired in 2001 and now live here every winter with my mother. Because we live here, the condo is equipped with everything we like for comfortable living. Spring 2010 we did a lot of decorating- new original art throughout the condo, fresh fabrics in the living room, new stainless steel appliances in the kitchen, and new twin mattresses in the third bedroom. 2011- We remodeled the kitchen with granite counters, cherry cabinets, glass back-splash and stainless steel accents. And of course I had to change the paint color- so the kitchen, main living area, front hall and hall bath were all painted to compliment the new kitchen. In 2012, we bought a new full size, front load washer and dryer. We love how quiet it is! Also, I finally replaced the old ceramic tile with beautiful 20 x 20 inch porcelain, and for the balcony got a new teak dining set that can seat up to 8 and last but not least, new shower-heads in the master and queen baths. And, in 2013, repainted both the queen and twin bedrooms and then with new drapes and bedskirt in the queen bedroom. Also, all bathrooms got new mirrors, vanity lights, towel bars and accessories. Did I say that tile is now in all the bedrooms? Yes, it is and I put throw rugs in all the bedrooms to make the rooms cozy and comfortable. In 2014, we put flat screen tvs in all the rooms and installed a new king mattress set for the master bedroom. 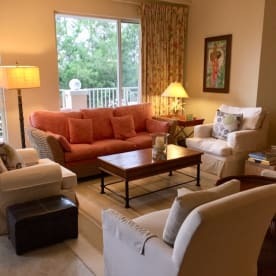 In 2015, new covers for the porch furniture and a new dining table with pendent lights in the great room.. Then in 2016 - the master suite got a makeover- drapes, linens and new paint color.. In 2017 a new 80g waterheater was installed, new HVAC system, new slipcovers for the comfy chairs in the main living area. Everything works! Everything is clean and ready for you! Hope you enjoy everything as much as we do.